Hi everyone. 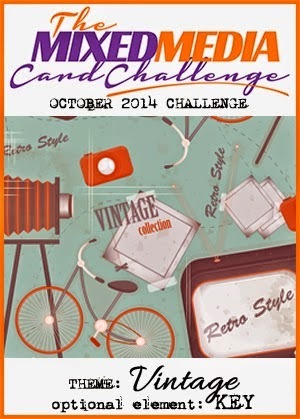 Time for a new challenge at Mixed Media Card Challenge (#4 - Vintage with optional element of key). I decided to make a Christmas card. The background design is made using yet another stencil cut with my Silhouette Cameo ... love the vintage look of the damask pattern. I sponged over the stencil with Antique Linen Distress Ink, adding more colour in the center. The script is my favorite background stamp ... and one of the few that I own. I inked up just the center and then stamped off once onto scrap paper before stamping onto my card front (second generation stamping) ... giving it a subtle effect. The poinsettia is cut from dark red card stock, coated in red glitter glue, and once dry, shaped with my stylus and mat. I added some gold foil sprigs in-behind the poinsettia and used gold liquid pearls for the center. A simple banner sentiment is stamped in the same distress ink as the script (Brushed Corduroy). I hope you'll check out the fabulous cards made by the rest of the Design Team HERE. And I hope you'll join in the fun and play along. The challenge is open until the 25th of the month ... so there's lots of time to enter. Hope to see you in the gallery! What an elegant vintage card! Beautiful! ablsolutely stunning - as are all the cards you design!! Wow...love this gorgeous Christmas design, Loll! The layout, the stencilled background and that stunning poinsettia...all simply fabulous! Damask totally shouts vintage :) It reminds me of a saree (which is an Indian dress) of my grandma :) with a gold damask pattern. I also like the bold red u added to the design ! 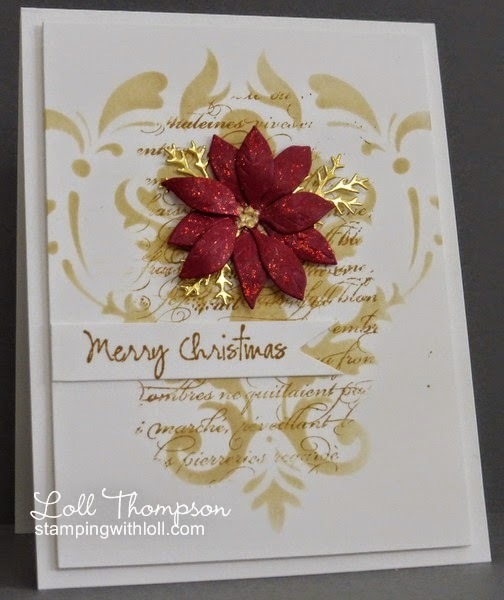 This is SO beautiful with the stenciling, the gold leaves and gorgeous red poinsettia Loll! This is so elegant, Loll! Love that stencil and the French Script always makes a sweet background! Love that poinsettia too! A truly gorgeous card, Loll - one of my favourites of your recent cards! May I give you an acronym, Loll? You are a DCWW. A die cut wonder worker! What you do with die cuts to bring them to life is amazing. And inspiring. your card is just gorgeous!!! love it! Beautiful card Loll, has just the right feel of vintage to it. I also love that background stamp; it's so useful. Stunning! I love the soft stencilled background with the script! Will definitely have to case you! Elegant is definitely the word, Loll! Every element of the card is perfect. Such a beautiful vintage card, Loll! The color combo is so pretty, and your damask pattern is perfect! Love all the texture on your Poinsettia, too! Elegant, classy, exquisite...I do declare that I'm a-swoon with the beauty of this card!